since starting the 9-to-5 I've really started making the most of my weekends. Busy is great but I try and make sure I have at least an hour to me, to re-set and make sure I feel prepared for the week ahead. This weekend I was away visiting family and upon my return home immediately became frustrated at the house work not getting done, my toenails remaining unpainted and my online shopping cart not getting purchased. An hour of pruning the garden and hot shower later, I felt more ready to relax. My weekends are mine. Even just for an hour. 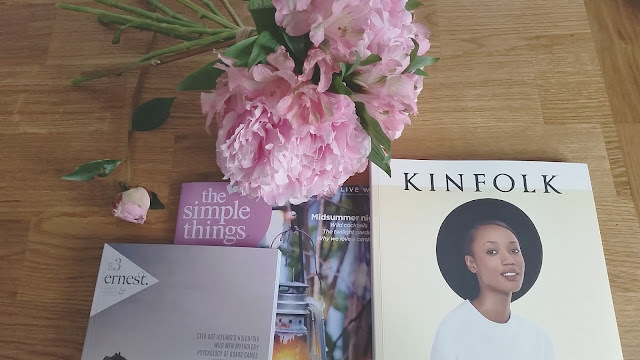 This weekend we enjoyed Ernest Journal and Kinfolk Magazine both bought from gorgeous Sheffield store, Moonko.